Tupac Acosta pounded on a drum as he and a handful of others tried to grab the attention of motorists headed down Camelback Road in Phoenix late Friday morning. 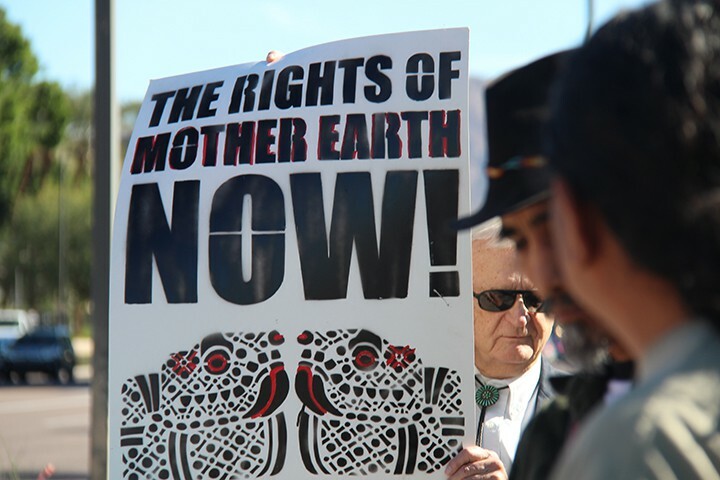 Their goal: Bring attention to a federal land exchange they say endangers an area sacred to the San Carlos Apache tribe. “Today’s action is an act of solidarity, a protest against the inclusion of Oak Flat in the National Defense Authorization Act that was passed in December,” Acosta said. 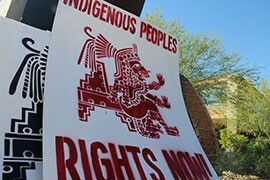 People from Tonatierra, an indigenous people’s organization, held up signs outside of Sen. John McCain’s office. McCain led the efforts to approve the land exchange with Resolution Copper Mining, which plans to break ground on a $61.4 billion mining operation in southeastern Arizona by mid-2020, according to its website. In a statement, McCain said the mine would generate an estimated 1,400 jobs and would have an economic impact of about $61.4 billion over its operational lifetime. Officials with Resolution Copper did not return calls seeking comment. The group held Friday’s protest in conjunction with a 44-mile march by others who oppose the mine. Marchers left from the San Carlos Apache Tribe’s administration office Thursday and plan on arriving to the Oak Flat campground Friday afternoon. Some participants plan on occupying the area for “however long it takes” said Vernelda Grant, an organizer of the march. 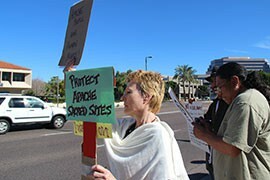 Organizers said there were planned protests in Tucson and Sedona as well. Protesters have said the environmental impacts the mine will have on water and air quality have concerned them. Protesters outside of Sen. John McCain’s Phoenix office on Friday stood in solidarity with marchers headed to Oak Flat campground. Cynthia Bittick, 57, held up signs outside of Sen. John McCain’s office. Protestors make signs to bring attention to a federal land exchange they say endangers an area sacred to the San Carlos Apache tribe. 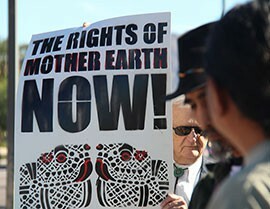 George Pauk, 78, holds a "Rights of Mother Earth Now" sign at the protest.